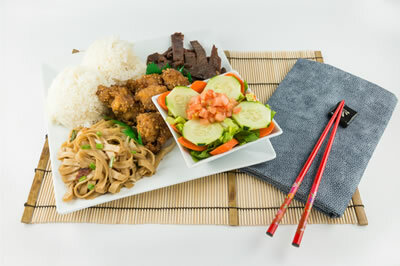 Choose one item from each category (salad, rice, noodles, chicken) listed below. Teriyaki beef included. Minimum of 25 people. 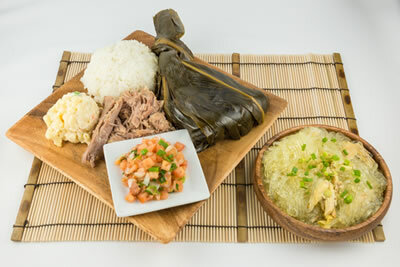 Choose one item from each category (salad, rice, laulau) listed below. Chicken long rice, kalua pork, lomi lomi salmon included. Minimum of 25 people. *Requires 1 week ordering notice for orders over 100 people. 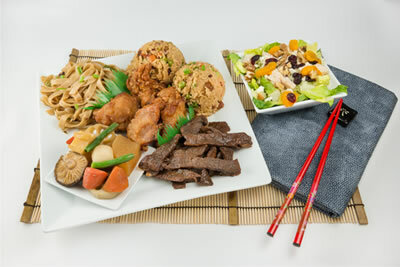 Choose one item from each category (salad, rice, noodles, chicken, beef, vegetables) listed below. Minimum of 25 people. *Meat Jun requires 2 day ordering notice. Set menus come in catering pans (half & full pans) according to how many people are in your party.